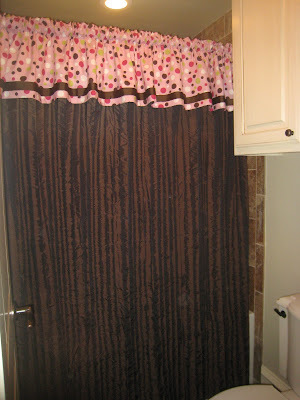 Whitney's Shower Curtain ~ Drab to Fab!!! Hi all! 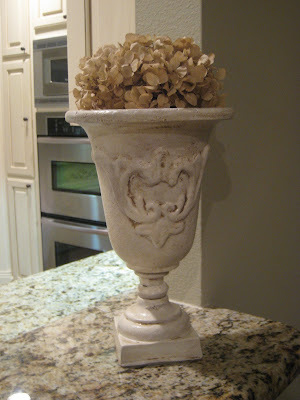 My Wonderful Whatnot for the day is my cracked Hobby Lobby vase! I watched Whitney’s kid’s while she ran to Hobby Lobby. She promised to bring me back something shanty and she did just that! 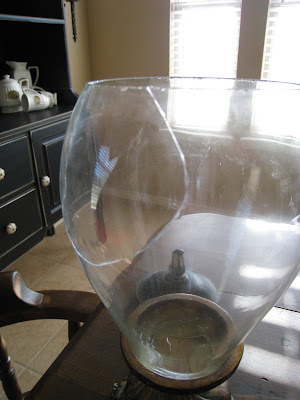 She came home with a metal/glass vase that had a huge piece missing…fortunately for me she still had the piece that broke off. She purchased it for $5!!!! I super glued the piece back in place, painted it with the Antique White Acrylic and Glazed it with the Ralph Lauren Smoke Glaze (of course). 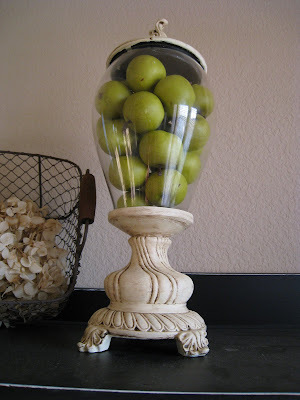 I then found a box of cute little green apples for $6 at Home Goods and voila! I placed it on the top of my hutch (crack to the back of course) and I just love how the green stands out! Enjoy! 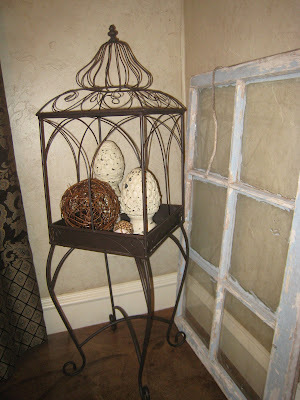 I will be posting this at The inspired room for Fall Nesting at http://theinspiredroom.net/2009/09/01/get-inspired-for-fall-fall-nesting-2009/ Check it out and be inspired! 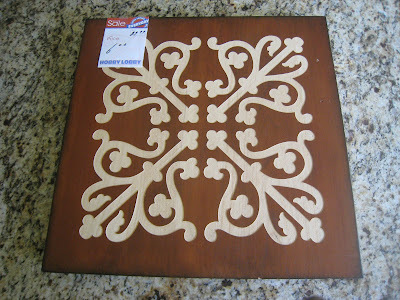 So I had another lucky day at Home Goods… LOVE that store. 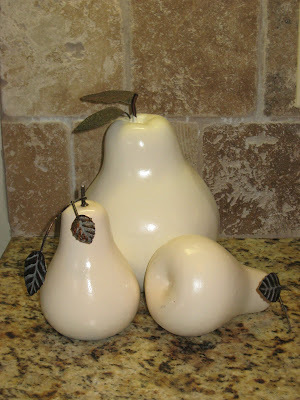 Like many of you, I too have been eyeing those Ballard pears and wanting some of my own. I wasn’t able to find an exact match but I do love my new wannabes! 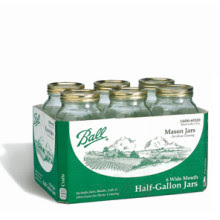 I found the 2 smaller ones for $3.99 a piece and the larger one for $6.99. 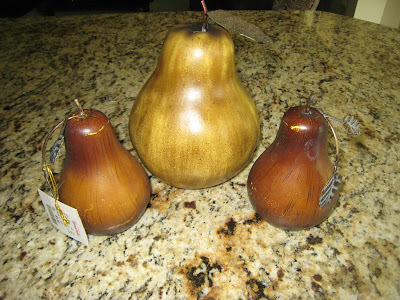 The two smaller ones were in terrible shape so I thought I would be able to bargain a cheaper price. I was told that this is “what they are supposed to look like”. I held back a laugh of disbelief and purchased them at regular price… $3.99 is still good and OF COURSE I will be painting them! 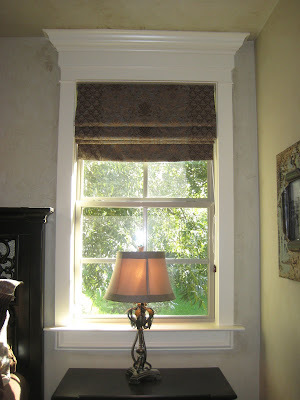 I will also be posting these cuties over at The Inspired Room for Fall Nesting... Check it out! ~You must let your base coat dry really well. 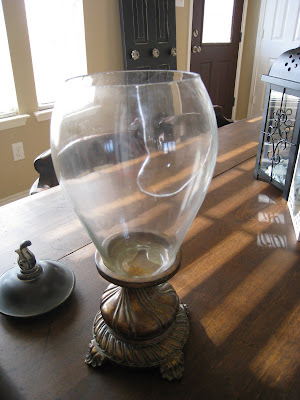 If you are using acrylic paint or spray paint that is usually only an hour or two. 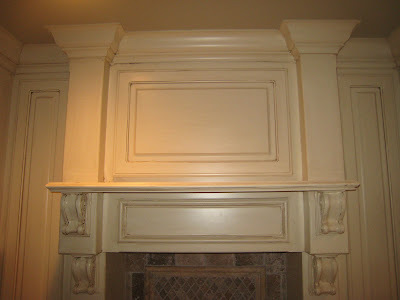 If you are using latex paint you should wait at least 12-24 hours. ~Your base coat needs to be at least an eggshell but I would recommend semi gloss or satin for a smoother finish. ~Once you have painted and wiped the glaze off, you can’t go back over it. It has a glue base and will pull all of your previous glaze off and you will then be angry…trust me. 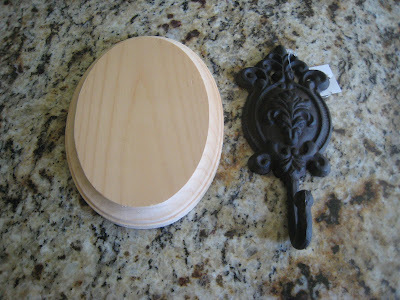 My final step was assembly… I attached the cute little knob to the wood oval and added a picture hook to the back. I then used a scrap of fabric from an old shirt to make a tie… stapled the ends to the back of the square and hung it on the wall. I am so pleased with the outcome. This little shanty cleaned up well. 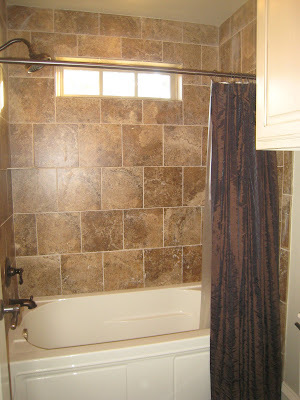 So, I have slowly been decorating the boy’s bathroom in a mature, rustic/cowboy theme. 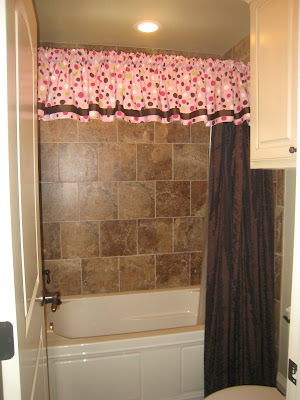 The towel bar was the last addition to the bathroom and that was some time ago so I decided that I needed to address their bathroom once again. I just wanted something cute and colorful to put on their counter tops and the idea went from there. 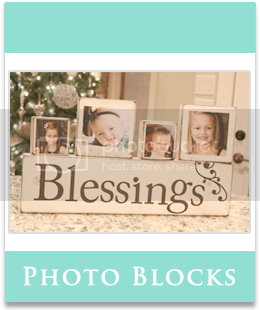 I bought 3 mason jars from Michaels at $1.27 each (I later found a set of 12 at Wal-Mart for $7 FYI) and that was the only purchase for this project…not bad! 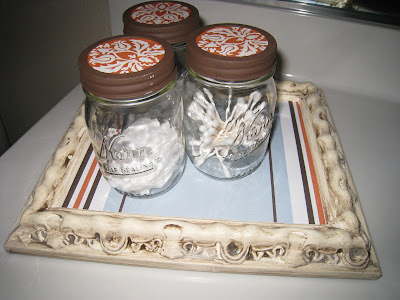 I decided to put bathroom necessities in the mason jars (q-tips, cotton balls, etc.) 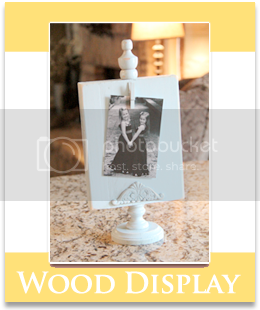 I liked Whitney’s idea on her dining room table to use the picture frame as a tray so I found a frame in my closet and began piecing everything together. I painted the rims on the tops of the jars with Burnt Umber Acrylic (2 coats) and I painted the frame with Antique White Acrylic (2 coats) and glazed with the Ralph Lauren Smoke Glaze. 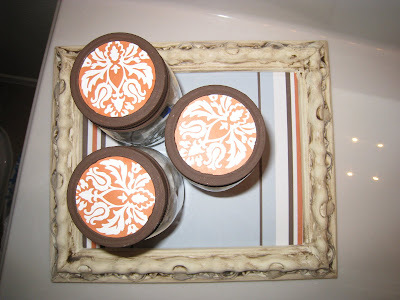 While the paint was drying I cut three circles out of a cute piece of scrapbook paper to fit the tops of the jars and I cut down a coordinating piece to fit in the frame (I did not use the glass on the frame). 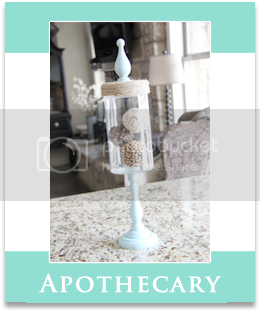 I filled each jar with necessities and when all was said and done I had a cute accessory for the bathroom counter that is also functional ~ As always ~ Enjoy! I will be posting this at A Soft Place to Land for DIY Day... Check it out... Lots of great ideas there!! http://asoftplacetoland-kimba.blogspot.com/2009/08/diy-day_26.html? Hi all! 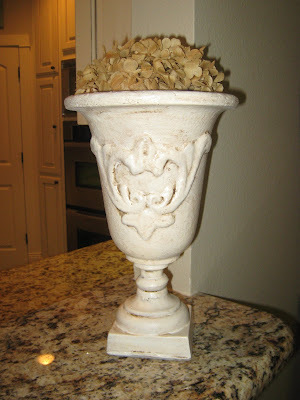 It’s back to school week and although I miss my boys dearly I now have more time for projects! 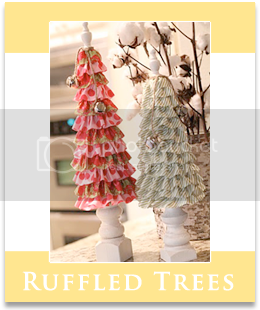 The project I’m sharing today is my Faux Hall Tree. I have wanted a hall tree for my entry/dining room since we moved into our new house. 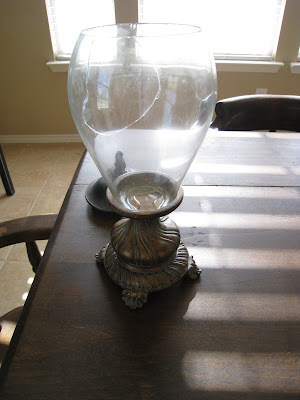 I scoured Craigslist daily but could not find one at a price I liked so I decided to make my own! 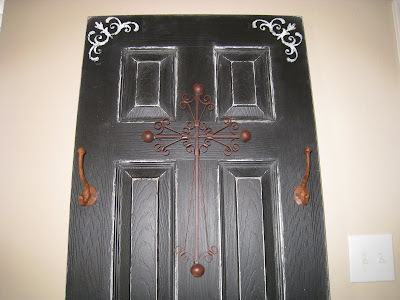 It started with a standard, white, 24 inch, 6-panel interior door that I purchased at Lowe’s for $19, a bucket of Behr Black/Black interior eggshell paint and a brush. 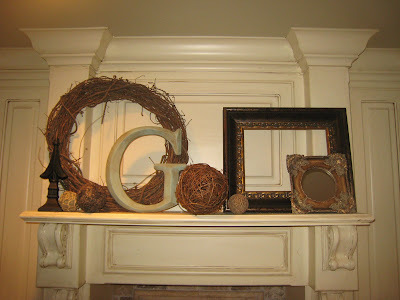 I headed over to Whitney’s house for our craft night and began my work! 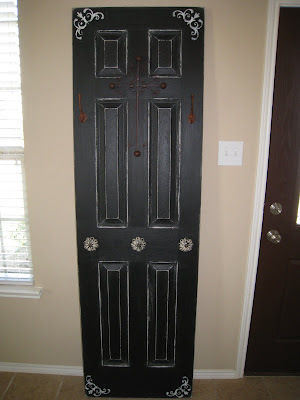 I painted two coats of the Black/Black eggshell on one side of the door and the edges. It dried pretty fast and I was so pleased it only needed two coats! 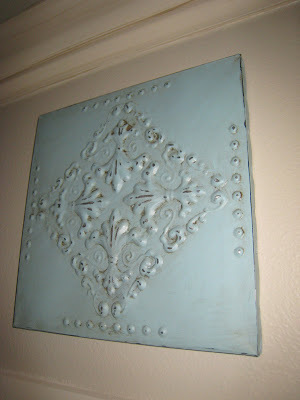 I then used a stencil that Whitney had made from the Cricut and sponged Antique White acrylic on the corners. 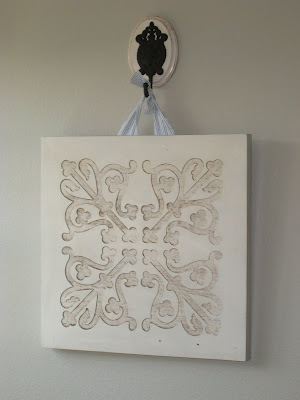 I added two hooks and a cross that Whitney had at her house (it really made a nice touch, I think). 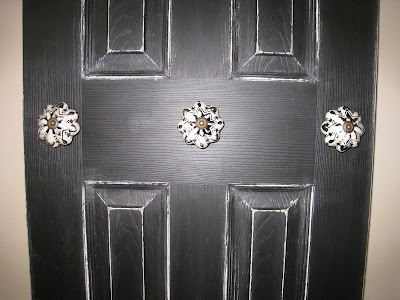 Next, I added 3 large knobs that I purchased at Hobby Lobby and it was time to distress! 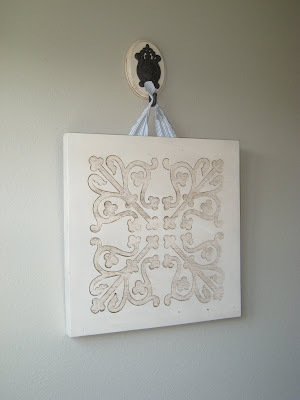 I used a 3M sanding block (my favorite tool to sand with) with 80 grit paper and distressed every edge and corner (I love distressing). I love how the white came through when I distressed it! 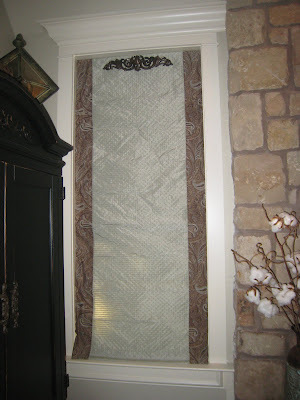 That was it and I now have a super cute Faux Hall Tree in my dining/entry way. I just leaned it up against the wall and it is surprisingly sturdy and I love the way it looks! Total cost ~ $28 ~ Enjoy! I will be posting this at A Soft Place to Land for DIY Day... Check it out... Lots of great ideas there!! I had stared at it long enough… It was time to make some decisions. 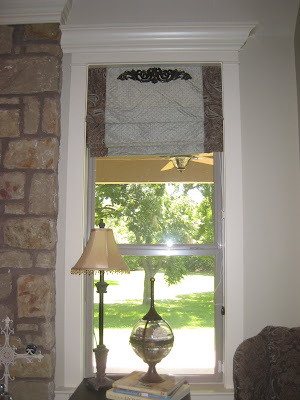 When we finished our home a few months back my kitchen mantle was one of my favorite places. I don’t have a mantle in any of my other rooms so I knew that I wanted one over my stove. I love it… just couldn’t decide what was worthy enough to sit up there… didn’t want anything that might hinder that love, you know?? Hi all! I haven’t posted any projects this past week ~ to say it has been a crazy week would be an understatement ~ but, on with the projects! My newest Wonderful Whatnot is my clock transformation! 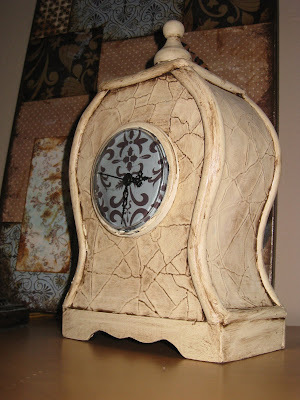 I was inspired by the clock that Kim did on her blog Twice Remembered! 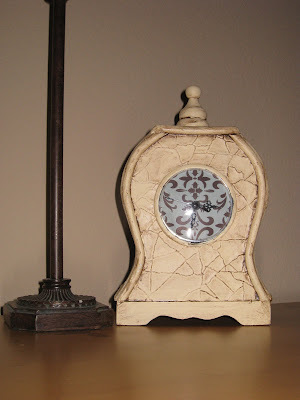 Her clock transformation turned out so wonderful that it inspired me to transform my own! 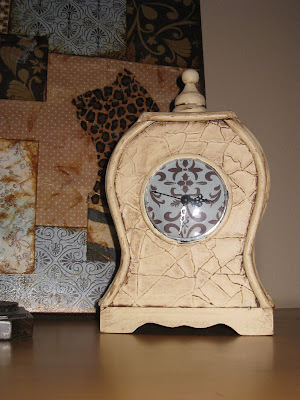 It started out as an average (as my cousin Jennifer would say) “commercial” brown clock. It was pretty but not exciting so I had to spice it up a little! Good Morning! My youngest sister is getting married today. It has been a crazy weekend already but I did manage to squeeze in a small blog… another whatnot that is. 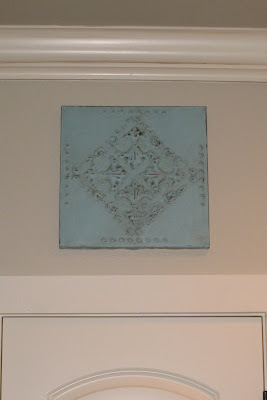 I have had this piece of pressed tin I bought at Hobby Lobby about a year ago sitting in my daughter’s room. It was $7 on sale which makes it a very thrifty whatnot. 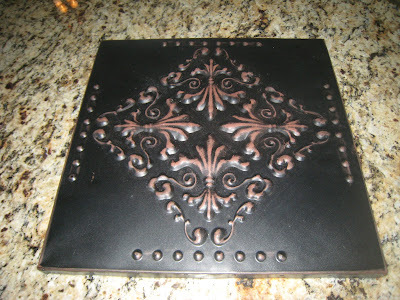 This piece of tin has definitely joined my “dark and boring” list… it was time to revamp! 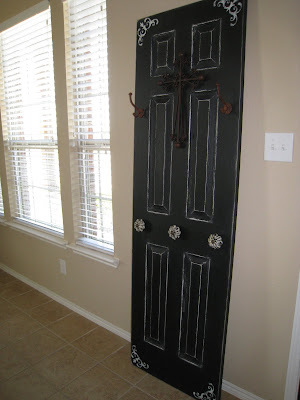 I will be posting this over at Shabby Chic Cottage for Transformation Thursday...Go check it out... Lots of smart ladies there!! 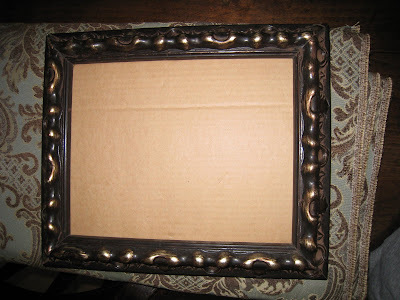 http://www.theshabbychiccottage.net/2009/08/tealight-tray-tutorial.html? 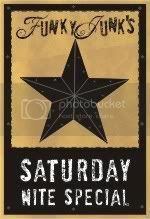 I will be joining Donna over at Funky Junk Interiors for her Saturday Nite Special! Scroll down for the button! 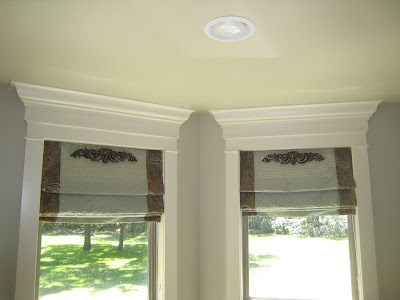 I found a series of tutorials on making your own roman shades. I am a visual learner so I decided to give it a try. After watching them I decided that I could for sure make my own. I won’t repeat the directions that she gives but I will tell you to check it out. 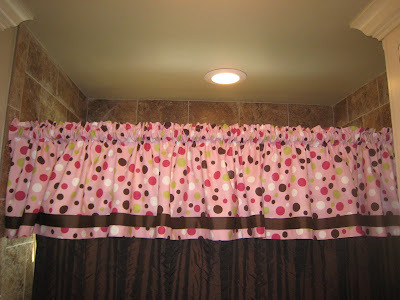 These require minimal sewing ability and they are super quick and cheap to make. I will offer my own advice from now making several of my own. ~ I used eye hooks rather than the pulleys and locking pulleys that she uses. 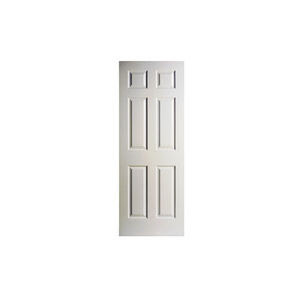 They are much cheaper and a heck of a lot easier to find. Just drill a pilot hole and twist it in. ~ I skip the Velcro all-together. 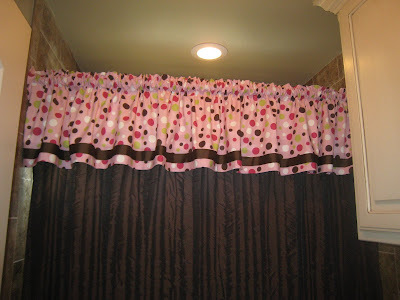 I just made my shades about 2 inches longer than her pattern, wrapped it around my 1x2 and stapled it. I think this is a much cleaner look. 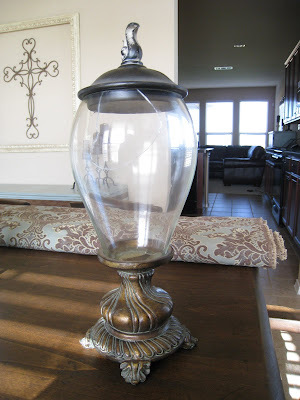 ~ I use a fan/light pull at the end of my cords… much cuter than that plastic thing. I had good intentions of sharing some of my larger projects this morning but decided to go with another whatnot… I love how this little one turned out! Ashley and I were rummaging HomeGoods last week. That’s where she landed her super cute tea set for nothing. 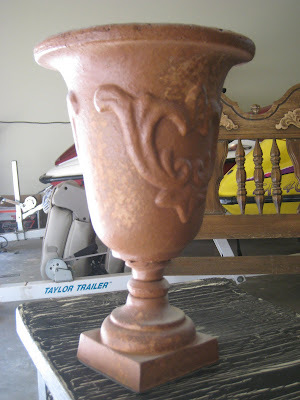 I was checking out the garden section when I stumbled upon this little shanty… I am certain it’s wonderful color of “not quite terracotta” is what landed on the clearance aisle for $7. Lucky me! 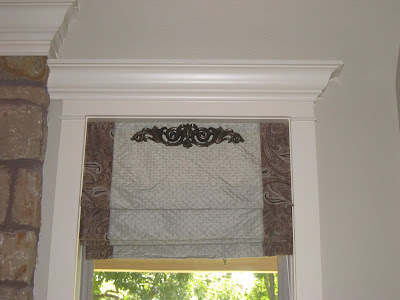 I love the shape of it and the detailing on the sides, and of course everything looks good painted so…. Ashley's Tea Set ~ A Thrifty Find! My latest Wonderful Whatnot turned out to be a favorite of mine! I now have an obsession with painting everything insight! 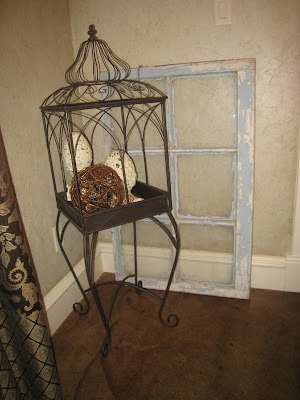 As I walk around my house something catches my eye and I am immediately on a mission to paint it! That’s where the story starts with my candle holders. They were just the basic gold cross candle holders…very commercial! I wanted to customize them right away! 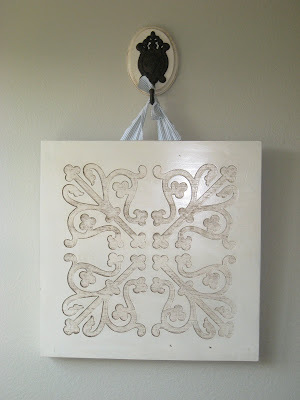 I painted them with the same Antique White acrylic I have been using and glazed them with the Ralph Lauren Smoke Glaze that Whitney owns (next can is on me ~ seeing how we use it every day!) 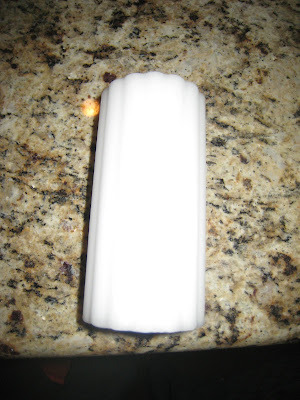 That was pretty much it as far as the candle holders go. I love the way the glaze caught the detail in the crosses!